Next up in for our festival artist interviews is none other than the vibrantly vivacious Ms Kirsty McKenzie! You can her work in our Punch show at the Espacio Gallery. For more info on the whole festival do pop over to our website. See you there! Tell us about your work and practice as an artist. 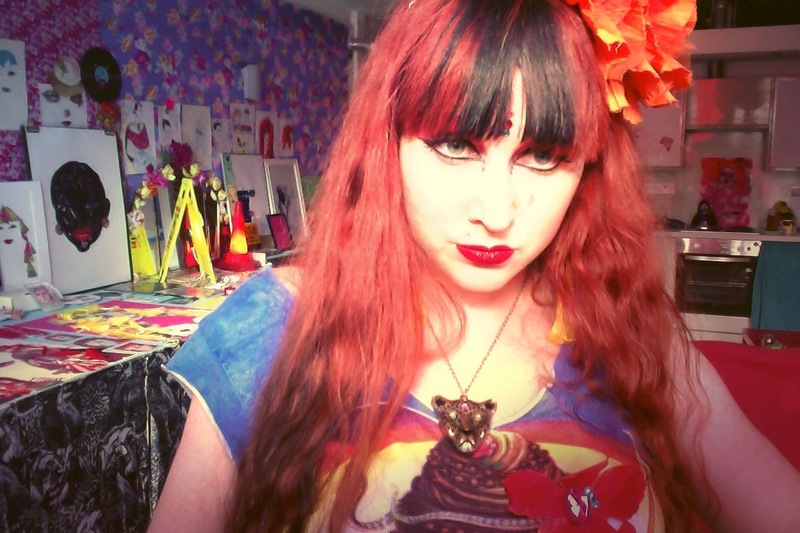 I live in my studio, which is a one big magical maximalist art installation. I’ve created my own world, where I am living my art, and being a total embodiment of my vision at all times. I live by ‘The 3 Es’: Exuberance, Eccentricity and Enlightenment. I have always been fiercely independent and individual, and in the last year feminist themes, and my identity as such, have seeped into my work a lot more. I explore the objectification of women and the feminine identity, defying sexual and gender stereotypes. 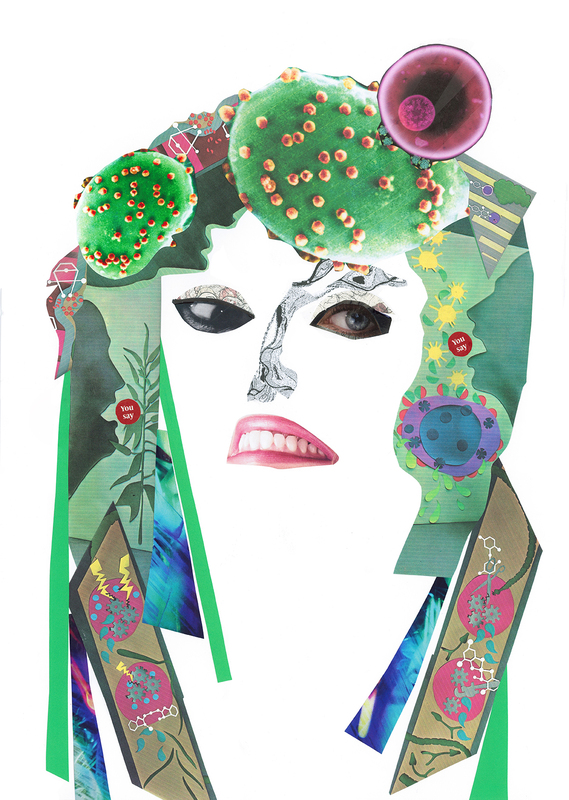 My work contains prominent themes of obsession and addiction. Contrarily, I capture a child-like exuberance, simplification and distortion of forms, with a brazen use of colour. I let my imagination lead the way; not holding back like most who feel they need to as adults. I studied Fashion design at RISD, and had straddled the fashion and costume worlds since. But really, I was an artist in a designer’s world. Until about a year ago, when I decided to dedicate my life to my art. And so I did. In the last year alone, I have created an insane body of work spanning from paintings, drawings and mixed media collages, 5 bloated sketchbooks, costumes, interior design, installation art, and now sound and video installations. In 2014 I was a contestant in Andrew Logan’s Alternative Miss World, and appeared on BBC One’s Your Home in their Hands – where I got to turn an unsuspecting family’s bedroom into an enchanted psychedelic boudoir, festooned with fabrics, bedazzled birds and twinkling bonsai tree! Feminist trailblazers. Unique artists who live their art and go all the way with their ‘thang’. Music. The moon. My Kundalini and meditation practice. Maximalism, complete colour saturation, power clashing, and CATS – anything with a feline motif. My inspirational individuals list includes: Vali Myers, Nina Hagen, Yayoi Kusama, John Waters, Frida Khalo, Frank Zappa, Les Claypool, Andrew Logan and Zandra Rhodes. What are you main plans and goals currently with regard to your practice? I recently screened my first video installation Cat Lady at an exhibition last month (https://www.youtube.com/watch?v=TMJY5DlBelw ). 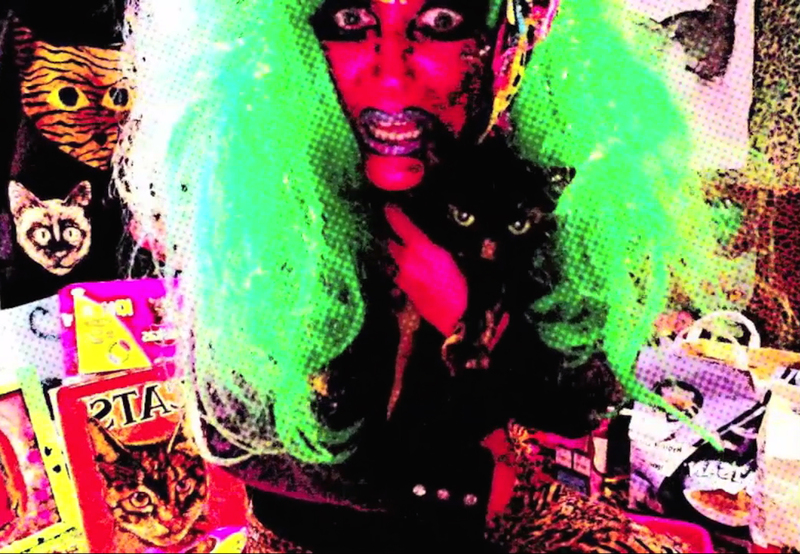 I definitely want to create more videos and do a live performance of Cat Lady. With this medium, I can truly create imagined worlds that entrance and entice the viewer, and incorporate my performance, costume, and music backgrounds. Cat Lady actually started as sound installations (as I create my own music and elaborate themed DJ mixes too), but also branched off from my ongoing painting, drawing and collage series The Cat Ladies. I am also working on some fabric collage stretched canvases, and stitched drawings, and would like to expand on that some more. I also just created my first ‘light’ sculpture pieces, as part of my Addiction series. I have been in 5 great group shows this year, but now I really want to have a solo show. I have 3 different series on the go, and the work is piling up! In addition to all that, I am expanding sales, both online and I am participating in the Plasticine Contemporary Art Fair in September. What has been your most fulfilling or exciting experience of being an artist to date? When I stopped being addicted to drugs, and became addicted to making art instead. In the past year, after getting clean – I completely rediscovered myself as an artist, and switched my focus from fashion and costumes to visual art. I struggled with drug addiction for 17 years of my life. Getting clean has been the best decision I’ve ever made, and led me to my current creative path where I am completely immersed in my work. I have reached creative highs unknown to me before, and often experience a straight euphoria and ‘art mania’; waking up at 5am to create feverishly until I drop! 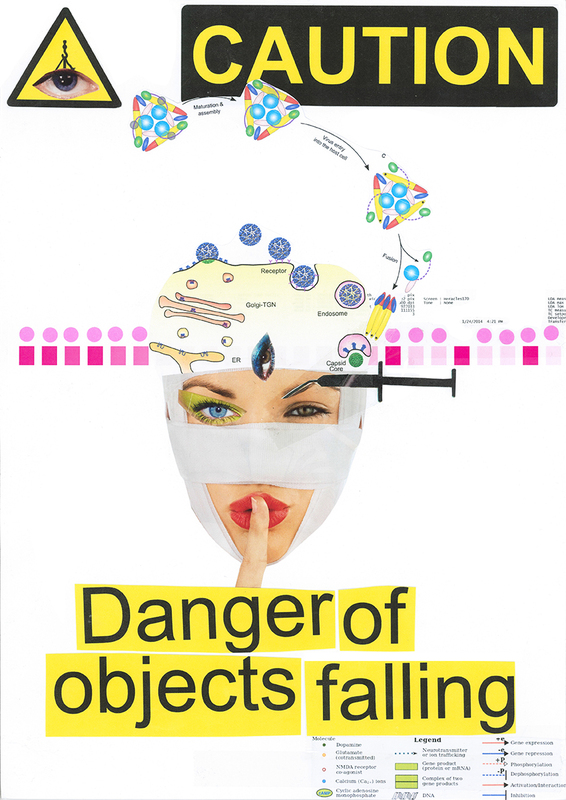 This year I started making art about my addiction, and recently had a piece from that series in the Chemcraft exhibition, curated by Christina Mitrentse Projects. It was a self portrait entitled Chemical Dependency, depicting the paranoia and frenzied obsession that comes with such a detrimental relationship. 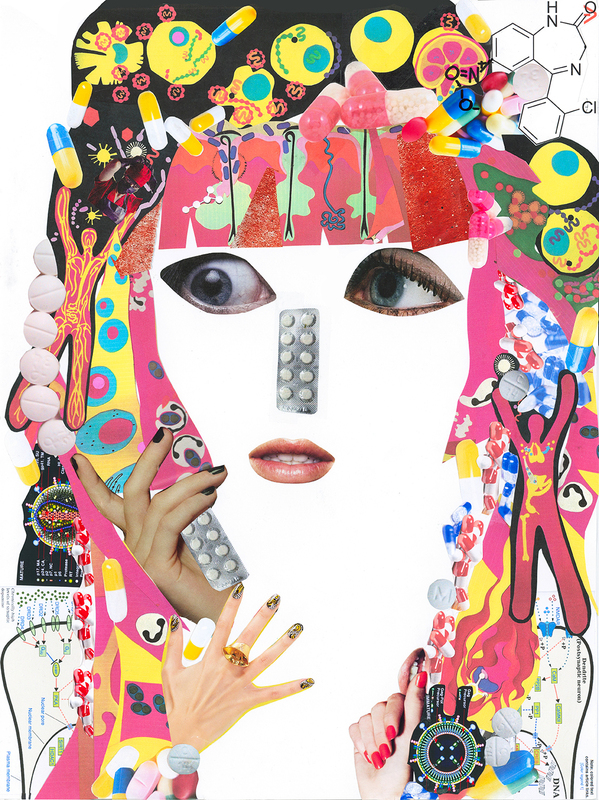 The mixed media collage includes pill package debris, the chemical compound of certain drugs, and diagrams of how they affect the brain. What kind of people do you enjoy spending time with the most? Well, right now, I’m a major loner, or as I like to say, a HermKitten. Getting clean took me out of my social butterfly phase and into a magnificent creative cocoon. I suddenly realized that I knew WAY too many people, and had more friends than I could cope with. But throughout the years, in all the places I’ve been, I have fallen in love with some serious kindred spirits. I adore creative characters who are authentic, strong, funny, and free. Folks who excite and inspire me, and always remain true to their radiant selves. None of that frontin’, name droppin’ or bein’ too cool for school – no haters and posers allowed in ma crew! Where will we meet in 5 years time? I am living my art to the fullest, and creating a magnificent multitude of projects. I have had several international one-WOman exhibtions, produced a plethora of video installations, more costume design, a kimono collection; with a wearable art/performance runway show…and loving every damn second of my life. I will have an ameowzing hypoallergenic cat that doesn’t incite my asthma (currently I’m a volunteer and foster mom with Cats Protection – as I need to take breaks. It’s tragic.). I have always had a dream of moving to California and finally getting my driver’s license… but I think I will still be in London? You never truly know where life will take you – and that is what it’s all about. Surrendering to the mystery of the Universe is so exciting.